[INQ. NO. 1502E15] Various types of wireless presenter models made by Chois Technology are now gaining high reputations among global users. XPS200 model (X-point pulse clip) was designed with the features enough to fully seize the attention of potential users. It supports laser pointing by using an exclusive app for smartphones (iPhone & Galaxy Phone). It can be used as a fashion item as a high-class “Appcessary.” It turns your smartphone into a full function presenter and remote mouse controller. Support of operating status on indicator light for safety (Patent No. 10-1081896) is available. The compatible app is X-pointer Lite (Available of download at App Store, Play Store for free). Only weighing 4g, this fashionable clip consumes less than 20 mA. Manufactured with 7.7 x 41mm, this product features a high slim design. XPS300 is a portable laser pointer and stylus pen with a simple design. It is a rechargeable laser pointer using a USB cable. It is an electrostatic stylus pen made with aluminum. It features perfect compatibility with the X-pointer App (Compatible App is X-pointer Lite). For safety, a laser indicator is supported. The luxury aluminum body design adds to its appearance value. Taking around two hours for charging, XPS300 guarantees at least six hours of using time. With the size of Ø9.4 x 149mm, it only weighs 20g. Less than 20 mA of current consumption is also a major factor in the customers’ choice for the product. The laser color (wavelength) is red (650nm). 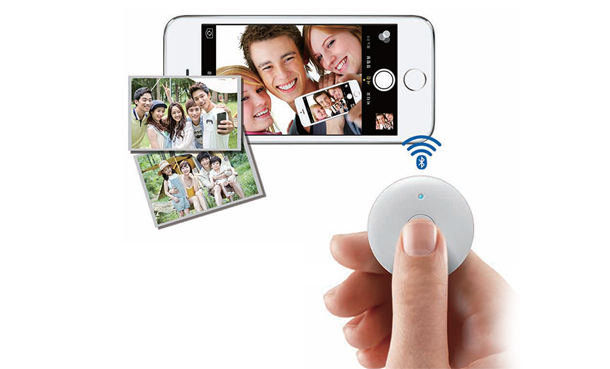 Chois Technology’s XSC200 is a smart multimedia remote controller and is compatible with Apple and Android smartphones. It gives a beauty of ergonomic compact design. It is available to turn over e-book pages on a smart device. 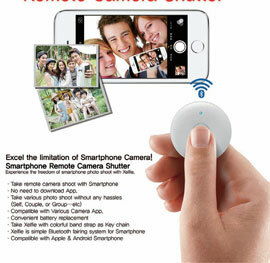 It is usable with a basic and various camera apps (e.g., camera 360 & candy camera, etc.). [INQ. NO. 1502E12] ChoisTechnology is well-known for its world’s first brand of “X-Pointer” that enables presenters to effectively present what they want to convey controlling the PC-based on support of USB RF wireless communications. Since 2001, under the brand of X-Pointer, Chois Technology has been steadily releasing more upgraded wireless presenters, growing into the leading wireless presenter producing company in South Korea. The export performance of various models of X-pointer riding on steady good approvals from global major electronics-related exhibitions is being well publicized through such potential markets as Japan, Germany, Turkey, and the U.S. on a steady pace of growth. Now, it occupies the top spot in the Korean market in terms of market share and technological leadership. This year, Chois Technology has decided that it would throw its hat in the ring to conspicuously extend its global presence in global potential smart device markets with its new flagship presenter “X-pointer mobile” by participating in upcoming CeBIT, IFA, and HKF. X-pointer mobile, the world’s first of its kind employing mobile functions, is a laser pointer using smartphones(mobile devices). Now, two versions – a version supplying a function of touch pen with a form of portable case and another version providing clip are ready for its global customers. 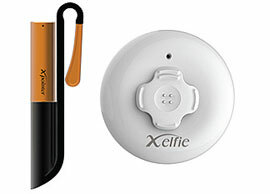 With this, presenters can perform their effective presentations anytime and anywhere with this innovative “X-pointer mobile featuring compact and simple design. This latest X-pointer mobile is expected to significantly help increase the possibility of customers’ business success. ChoisTechnology plans to continuously unveil subsequent follow-up models for global markets through effectively applying wireless and interface sensing technology with apps based upon stable and reliable production technology. Chois Technology will continue to develop and commercialize devices and apps working together with various kinds of smart devices. This means it will contribute to market expansion of accessories areas in global markets.